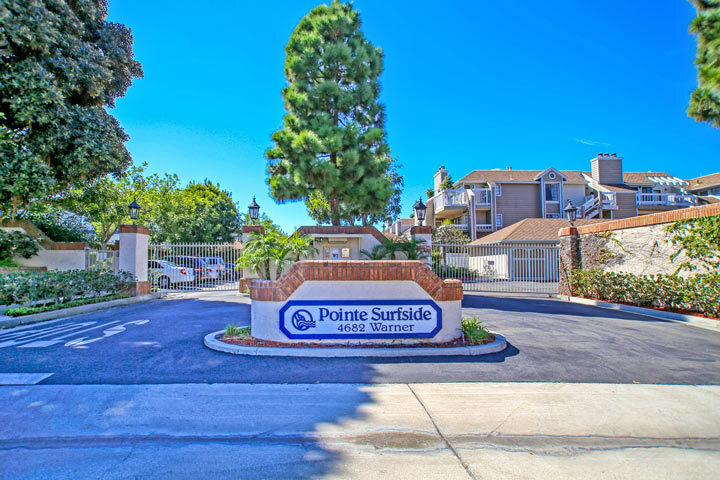 Pointe Surfside homes are located in the West Huntington Beach area of Huntington Beach, California. Pointe Surfside is a great gated community located on Warner Avenue. The condos were built here between 1981 to 1982 and feature one to three bedroom floor plans that range in size from 936 to 1,413 square feet of living space. The complex is under a homeowners association with monthly dues required. The dues include a nice association pool, spa, tennis courts and clubhouse. These condos are beach close with relaxing streams that run throughout the complex. Select condos will have vaulted ceilings and a view deck. Below are the current Pointe Surfside condos for sale and for lease in Huntington Beach. Please contact us at 888-990-7111 with questions regarding this community and any of the condos listed for sale here.